I know my 7 cats go crazy every summer just to get out of the house and enjoy the great outdoors. It is not a problem for my household because we live 1/2 mile up the lane from the street so there is no fear my friends will not get run over by a car. 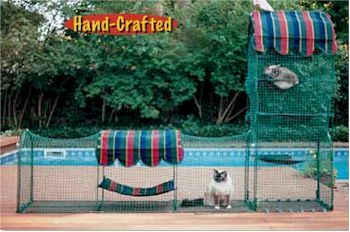 For those households that live in the city, the Kittywalk Cat Enclosure is the perfect answer to the problem of their cats getting hurt by passing traffic. Let them enjoy the greater outdoors in the perfect enclosuer and giving you the peace of mind they are safe in the backyard.